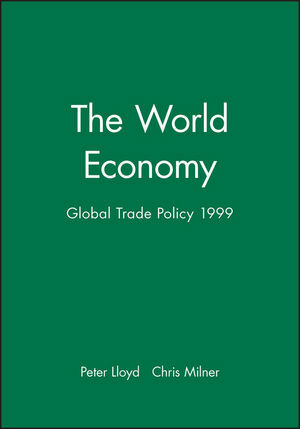 This volume is the fifth in a an annual series in which top economists provide a concise and accessible evaluation of major developments in trade and trade policy. * An accessible and digestable information source on current trade and policy developments at global, regional and national levels. * Internationaland highly respected authors. * Independent assessments of international agencies and the GATT Trade Policy Review Mechanism. Peter Lloyd is Professor of Economics at the Department of Economics, The University of Melbourne. Chris Milner is Professor of International Economics at the School of Economics, The University of Nottingham. 1. Editorial Introduction: Peter Lloyd and Chris Milner. 2. The World Bank Policies Towards Trade and Trade Reform Policy: Anne O. Kreueger and Sarath Rajapatirana. 3. WTO Trade Policy Review Mechanism: From through the Looking Glass: Sam Laird. 4. Whither the Free Trade Area of the Americas? : Jeffrey Schott and Gary Hufbauer. 5. The Free Trade Area of the Americas: A Latin American Perspective: José Tavares De Araujo Jr and José M. Salazar-Xirinachs. 6. The WTO Trade Policy Reviews of India, 1998: Arvind Panagariya. 7. Beyond Transparency: An Analysis of the Trade Policy Review of the European Union: P. K. M. Tharakan. 8. WTO Accession Issues: Rolf J. Langhammer and Matthias Lücke. 9. Competition Policy, Developing Countries and THE wto: Bernard Hoekman and Peter Holmes. 10. Trade and Competition: An Industrial Economist's Perspective: Stephen Martin.